Anglo Saxon writing workshops | Hail Spartapuss! Mogzilla Books for Children and Adults of all ages! 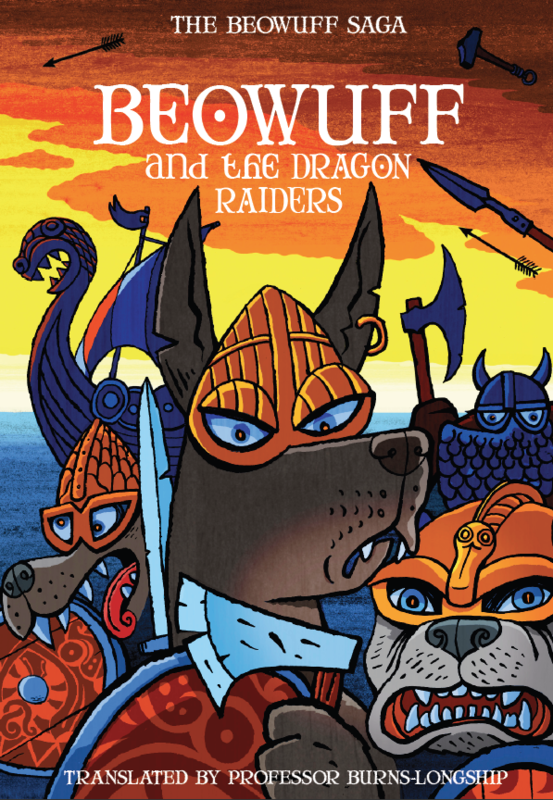 Whilst researching my children’s series Beowuff I found that the Anglo Saxon period is an amazingly rich source of tales and legends which are ideal for story writing. The Saxons told tales of monsters like the sea serpents, elves, charms, dragons. Alternatively, you can write a realistic tale about King Alfred and the cakes or Saxons batting against their sworn enemies The Vikings. 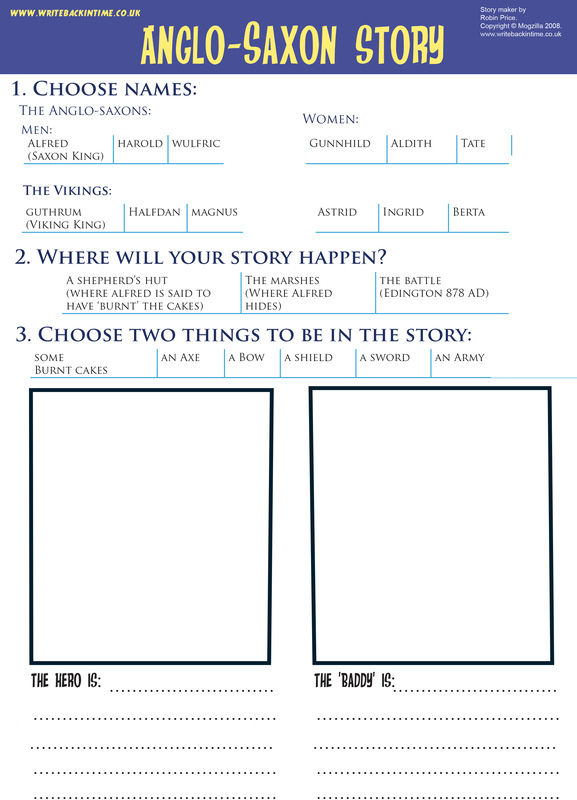 If you want to write your own Anglo Saxon story, the ‘flash writing’ story maker on this page will speed you through the planning part and help you get going. (Teachers: see the instructions below the story maker for tips on how to use it in class). If you’d rather write a story about the Romans or the Stone Age – click on one of the historical periods in the right hand navigation. When I’m not writing books I lead history workshops for primary and secondary schools In the past I have run workshops for Shakespeare’s Birthplace Trust and the Young Archaeologists society. I also visit international schools with Author’s Abroad. Teaching the Anglo Saxons through creative writing is great fun and I’m amazed at what the pupils can come up with when they write their own stories. Email robin@mogzilla.co.uk or call me on 0844 884 1742 if you’d like to discuss prices and availability. For my free .pdf ‘7 Tips for teaching story writing’ email robin@mogzilla.co.uk with ‘Tips’ in the subject line. If you’re not familiar with the Beowuff series – it’s set in a world ruled by dogs! It’s suitable for children aged 7 years old. • Techniques like the ‘story mountain’ are ideal for ‘planners’ but they leave other children struggling to focus. To get everyone off to a good start, I have developed ‘flash’ stories. Armed with a simple framework (like the one above), you can move swiftly through the planning and get their ideas flowing onto paper. 4. The person who isn’t writing can draw a picture of their goodie or baddie. TIP: This writing frame was designed for Y1-Y2. I have a more challenging writing frame for older children (Y3-Y6). I have colour coded the writing frames so that blue = easy and purple = medium. Green = challenging. Because creative writing is very open ended – you could use this frame with Y6 and still get some cool results. If you like this approach, there are a lot of ways you can develop it and use it in class. You can introduce or practice new vocab or structures, practice dialogue or even use two flash stories (a few weeks apart) to assess their progress. Flash stories are also ideal for assisted learning (where the adult takes the part of one pair). For my free .pdf ‘7 Tips for teaching story writing’ please email robin@mogzilla.co.uk with ‘Tips’ in the subject line or call 0845 838 5526 to discuss a workshop. I wrote the first Beowuff book with Richard Eccles – and we had great fun researching it. Hrothgar. 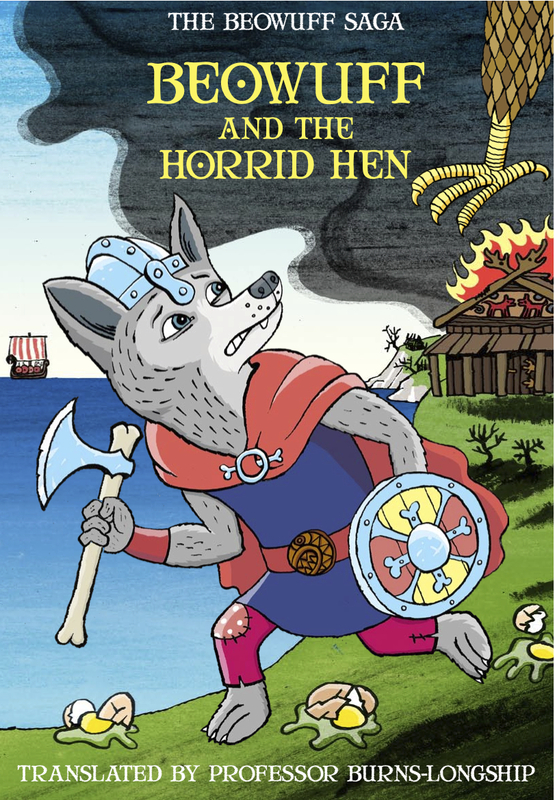 Instead of fighting Grendel, Beowuff must do battle with Hendel – a monstrous chicken.